The Great American Backyard Campout is this weekend. Where will you pitch your tent? This national night dedicated to getting families outdoors, held on June 23 this year, includes community events, where families get together in local parks to share picnics and sleep under the stars. But it isn’t the only way for urban families to try camping close to home: In New York City, two free programs that run throughout the summer can help. Here’s some information from AMC’s new Kids Outdoors online community about plans for the campout this weekend and opportunities for urban camping in Boston and New York City. The easiest way to join in the campout this weekend, if you have the gear and the yard, is simply to set up your tent and spend a night with your kids outside, while still close to the comforts of home. It’s a great first step if you are getting started for the season – or if you’re camping for the first time. But the Great American Backyard Campout, sponsored by the National Wildlife Federation, expands beyond private yards to team events and public campouts at local parks. These can offer a great spirit of camaraderie. In the Boston area, the First Parish Church in Dorchester has organized a team, and there are also two public teams in Weymouth and Leominster. To find a gathering in your area, check out the website. REI, one of the national sponsors of the event, has put together a 28-page kids' adventure journal that can be downloaded for free. In it, kids can keep track of their outdoor excursions, sketch animals they spot, and play nature-themed puzzles and games. If you want to get a little farther from home but still stay in the Boston area, try camping on one of the four Boston Harbor Islands that offer rustic sites. Reservations are required. Two free camping programs that run all summer help New York City families get started. 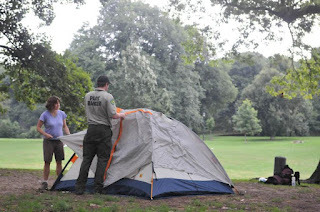 Urban Park Rangers, who work for the city Department of Parks and Recreation, host free camping excursions Friday and Saturday nights at parks in all five boroughs from May through August. The programs start between 5 p.m. and 7 p.m. on Fridays and Saturdays and are open to about 30 participants, who are selected by lottery. The recommended age is 4 and older. Evenings begin with a cookout and a hands-on tutorial on setting up a tent. Tents and food are provided, but campers must bring their own sleeping bags and flashlights or headlamps, because the event features a night hike. Camping spots are located near restrooms, and a team of rangers rotates staying awake through the night to answer questions or offer help if it’s needed. National Park Rangers run a similar program at Floyd Bennett Field, part of the Gateway National Recreation Area, in Brooklyn. The program is held one weekend per month from June through September, and the recommended age is 6 and older. Campers bring their own food but all other equipment, including cooking utensils, is provided. Sleeping bags are available to rent for $8, or you can bring your own. Restrooms and drinking water are next to the campsite. The program starts at 2 p.m. on Saturdays and features independent and ranger-led hikes, meal time, and camping instruction. Sunday mornings begin at 8 a.m. with a pre-breakfast birding and nature hike. After breakfast, rangers drive everyone to nearby Jacob Riis Park for kayaking and seining (catch-and-release fishing using large nets). For New York families ready to camp on their own, but still looking to stay close to home, Floyd Bennett is the only place in the five boroughs with a public campground. It has about 35 tent sites and six RV sites. Reservations and permits are required in advance. See AMC’s picks for family-friendly, tent-only campgrounds in the Northeast. See more family-friendly campground recommendations from AMC. Check out this state by state list of parks and camping links. Get suggestions for camp cooking with children. Find the perfect family tent. Hat tips to bloggers Kim Foley MacKinnon and Cheryl and William de Jong-Lambert, who write weekly for the Kids Outdoors community. Photo of setting up camp in Prospect Park courtesy of the New York City Department of Parks and Recreation.